Of the Executive Presidents who ruled the country prior to Maithripala Sirisena, J.R. Jayewardene and Mahinda Rajapaksa can be described as those who mostly and increasingly exhibited the majesty and the prowess of the post. Both had adequate powers to do so. In fact, J.R. Jayewardene boasted that the only thing he could not do was to make a man a woman and vice versa. Dr. Colvin R de Silva, a most erudite expert on constitutional affairs, once said that even if the president had lost his mental capacities, it would involve a lengthy process to remove him from office and as such we are compelled to be tolerant with a President who is not only unsuitable for the post but also has lost his mental capacities. The role being played presently by President Maithripala Sirisena exhibiting his power is something unique and unprecedented which no other previous presidents have ever attempted. 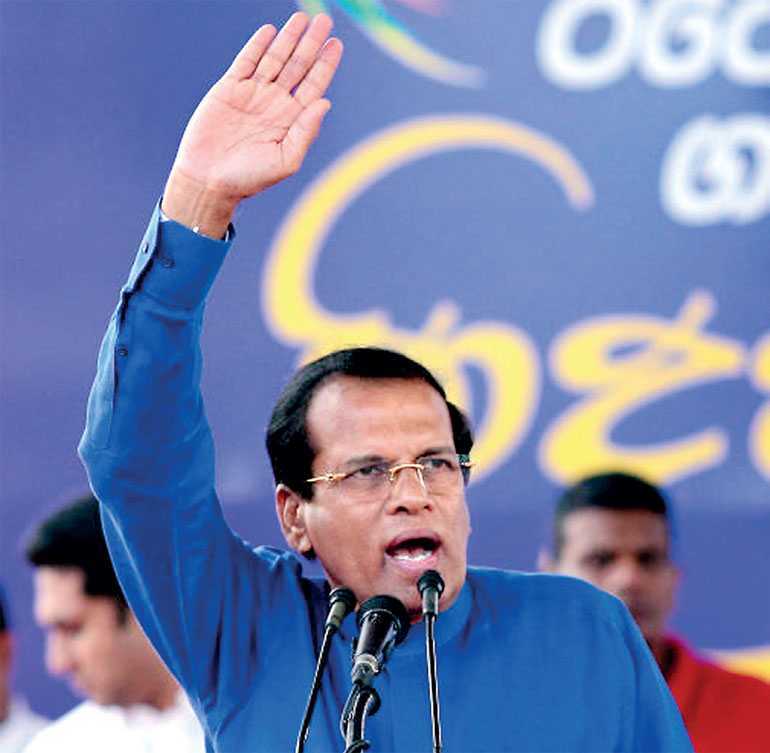 One important aspect of this scenario is that the people or the public officers including the Police and the three armed forces have not realised that the incumbent President Maithripala Sirisena is not equipped with powers to do what he is doing at the moment. President Maithripala Sirisena compared to his predecessors can be considered relatively a nominal head of State with most of his Executive powers removed.The 19th Amendment deprived the President of most of his Executive powers. Yet, he is playing the role of a full-fledged lion. In terms of the limited powers vested in him by the Constitution, he can no longer be considered a lion. He is only a man in the lion’s skin. Yet, he has been able to frighten the people like a true lion. This scenario can be described as a new creative version of the drama called ‘Suba saha Yasa,’ a popular political satire staged by late Simon Nawagaththegama. The people did not know it was Suba, the doorkeeper, who was on the throne. They perceived him as the true king. This confusion depicted in ‘Suba saha Yasa’ is analogous to the present constitutional crisis in the country and can be seen operating in a different form. Irrespective of the rationality or not of the 19th Amendment, it largely stripped the President of his Executive powers, reducing his status to a level of a nominal president. The 19th Amendment was effected with the intention of transferring Executive powers of the president to prime minister. Hence, the Government followed a silent policy of not enlightening the people of the true impact of the 19th Amendment which drastically reduced the powers of the President; further, the Government remained silent about explaining the people about the extent of changes effected to the powers enjoyed by the incumbent President. On the other hand, the incumbent President was elected on the old system. The reduction of Executive powers was effected only after he was elected the President. So much so, as the President remained the head of the Yahapalana Government, he was been allowed to enjoy the old glamour inherent in the post of president despite most of his Executive powers being removed. Under the circumstances, not only the people, even the public officials and the bureaucracy were not aware that the status of the President had been reduced to the level of a nominal head of State following the 19th Amendment which removed most of the powers held by the previous presidents. Even the prospective candidates of the forthcoming presidential election 2020 were not aware of this reality. It was the author of this article who for the first time, brought to the notice of the public that the president elected following the 19th Amendment would no longer be an executive president but only a nominal head of State. It was when this debate was on that the incumbent President initiated the miracle of regime change. If the President is compared to a bird, then it is this President bird, whose wings have been clipped by Prime Minister Ranil Wickremesinghe, who flies high in the sky making acrobatic movements and surprising the spectators. Previous Presidents violated the Constitution many times when they had absolute and unlimited powers which even the Constitution itself could not control. The irony is that the present President has done the same when he has no such power. Under the old system prior to the enactment of the 19th Amendment, the president had the authority to remove the cabinet of ministers including the prime minister and appoint a new prime minister and a new cabinet at his discretion. He also had the power to prorogue Parliament and dissolve it at any time after one year from the first meeting at his wish. But, according to the 19th Amendment the president cannot decide on the prime minister. Nor can he decide the cabinet of ministers. The leader of the political party that commands the majority support of the Parliament will become the prime minister who in turn will appoint the cabinet of ministers. The president cannot change the cabinet of ministers appointed this way. It could only be changed in the event of the defeat of a no confidence motion against the PM and the cabinet of ministers. The sacking of the former Prime Minister and the Cabinet of Ministers, appointing a new Prime Minister and a new Cabinet of Ministers, and thereafter, proroguing and later dissolving Parliament, has been effected by the incumbent President not by any power derived from the Constitution but through assuming an artificial power on him. It does not appear to be an error made without a proper knowledge of the Constitution. If the President’s intention was genuine, he could have referred the matter to the Supreme Court before attempting this change and obtained its advice on the legality and the constitutionality of this issue. It is not difficult to understand that he intentionally ignored this course of action as he was adamant to pursue his design which is arbitrary and ruthless. The method the President has adopted is unconventional, immoral and anti-democratic. It is extremely ruthless and as destructive as an atomic bomb. In a political sense, the President is engaged in a role analogous to that of a suicide bomber. What the President has done can be considered a dangerous and evil design initiated with the intention of taking revenge not only from Ranil Wickremesinghe, his new opponent, but also from all organisations that brought him to power, their members, Mahinda Rajapaksa, his old foe who has embraced him presently with a feigned smile and friendship, and his followers and eventually plunging the entire country into destruction including himself. I may perhaps be the only person who publicly criticised the idea of fielding a non-party common candidate at the presidential election to defeat the regime of Mahinda Rajapaksa. At the time it remained the only alternative that excited and inspired the anti-Mahinda forces. I met venerable Sobitha Thero and warned him against it. I questioned Sobitha Thero, ‘Even if MR is defeated by fielding a common candidate picked from somewhere, what is the guarantee that after victory he will not assert his powers and resort to an arbitrary course of action?’ The Thero kept looking at my face but did not answer my question. The limited reforms introduced by the ‘Movement for a Just Society,’ which caused much excitement among the people, too, came under my serious protest and criticism. I pointed out that even though the errors and defects of a system of government could be rectified by a simple constitutional reform, it would not be possible to replace a system of government with a completely new system through simple constitutional reform; it is also contrary to the principles of constitution-making. Further, I explained that the 19th Amendment proposed by Jayampathi Wickramarathna to the ‘Movement for a Just Society’ would end up in turning the system of governance into chaos and eventually plunge the country into a state of anarchy. The leaders who shouldered the burden of the ‘Good Governance’ campaign regrettably lacked the tolerance and acumen to fathom the dangers that I signalled. At that specific moment, even Ravaya officially appeared for the 19th Amendment. Many critics including Ravaya failed to see the destructive cancer inherent in the 19th Amendment. They saw only the ostentatious changes effected such as the Right to Information Act, reduction of the term of the office of the president for five years and limitation of the presidential powers, etc. After passing the 19th Amendment though with defects inherent in it, I warned the country through the ‘Punarudaya Movement’ about the next big crisis likely to happen. I pointed out that the 19th Amendment had distorted the Constitution and plunged the entire system of governance into a deep crisis and in consequence, Sri Lanka is moving towards a serious anarchic state. Thereafter, several months before the constitutional crisis came to the forefront, I repeatedly predicted the advent of a serious constitutional crisis prior to the next presidential election. I repeatedly stressed that the country had already reached the verge of full anarchy. This prediction made by the ‘Punarudaya Movement’ has now come true. The suicidal political operation initiated by the President has gone so far that it will not be possible to defeat or reverse it. The atomic bomb that he has shed on the country will blast to its very end. The destruction caused to the country will be immense. It might end one era completely. It will destroy not only Ranil Wickremesinghe and Mahinda Rajapaksa, but will also overwhelm all the leaders of the old generation, the putrid system of all institutions, system of government and the Constitution as well. It won’t stop at that; it will destroy the entire economy and plunge the country into a state of bankruptcy, thereby thrusting the people into a near-death situation. The next age has to emerge phoenix-like from the dust and the debris left after a great devastation. The country will be compelled to start everything anew. If the people are intelligent, they can still turn a great catastrophe into a source of happiness the way the Japanese and the Germans did!